Christmas is only a few weeks away and All Slots Casino is already in the festive spirit with their Christmas Market promotion, where you can win a share of $25,000. Running up until Christmas Day, players can earn Christmas coins to buy free spins, bonuses, and even cashback at the Christmas Market. But the main lure is the chance of bagging one of the major cash prizes in the Christmas Draw. One loyalty point is equivalent to one Christmas coin so you are only limited to what you can purchase at the market by how much you play (see below on how to earn loyalty points). Once you’ve earned enough loyalty points you can head to www.AllSlotsCasino.com and click on the promotions page, and then on the Christmas Market promotion link. Here, enter your username and then on ‘Go to Market’ to view what’s for sale and make a purchase. The Free Spins are only available on Avalon, Bridesmaids, Immortal Romance, Secret Santa, and Santa’s Wild Ride. Players can only buy one cashback bonus per deposit and it must be purchased before you make that deposit. It is important to note, every time you purchase a bonus your loyalty points will be depleted, but it will not affect your loyalty tier if you are a regular player. Additionally, any pre-existing loyalty points count towards your coin balance, and any game you play and earn loyalty points on from now up until December 25 contribute too. You can view your coin balance at the top of the page, and will be updated 15 minutes after you buy a bonus. For every bonus you purchase at the market, you will earn a ticket into the Boxing Day draw, which takes place on December 26. The more bonuses you buy the more tickets you will earn. To earn Christmas coins you need to earn loyalty points, as one loyalty point equals one Christmas coin. 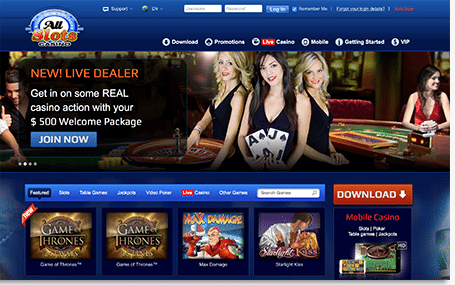 You can easily accrue loyalty points simply by playing real money titles at All Slots Casino. You can earn one loyalty point by wagering the following amounts on the following Microgaming games. If you want to earn points/coins fast, we recommend playing the pokies, American roulette or any Palour titles. So head to the market before December 25 and enjoy a bonus this Christmas, and a potential share of $25,000. On top of this fantastic Christmas promotion, All Slots Casino give all new customers up to $1600 in matched deposits – one of the most generous offers on the web.